Now that we are finally getting some warm weather - Paul & Joe introduces Come Sail Away - a limited edition, nautical themed summer collection outfitted in adorable sailboat and beach inspired packaging. Come Sail Away (003) - a palette of lively and dynamic summer shades, perfect for sailing the day away. Cat Lipstick L Refills - $20 - in 3 summery shades: Catamaran (001) - the combination of a healthy red and soft natural beige gives lips a boost of dewy colour; Smooth Sailing (002) - perfect your pout with a pop of pink from this vibrant duo; Ahoy (003) - go for bold with the pairing of clear beige and vivid summer red - with a combination of dewy shine and vivid pigment for a light colourful glow, ideal for hot summer days - and what's really great, because of the process used to make them, the cat faces remain visible until the lipstick is used up. The outer lipstick is transparent, formulated with a generous amount of oils such as Cocoa Seed Butter, Jojoba Seed Oil and Lavander Oil to nourish lips and help the inner colour adhere while the inner, cat-shaped layer carries the light veil of colour. 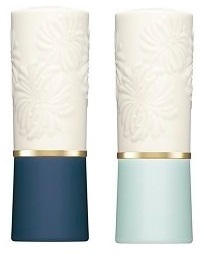 Lipstick Case A - $7 - nautical inspired limited edition cases come in two chic colours; a two tone case in classic navy (001) and white and a soft and sweet version in powder blue and white (002). 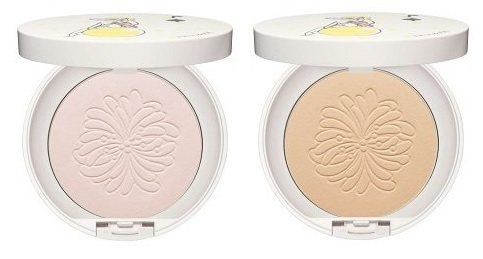 Silky Pressed Powder Compacts - $48 - in two shades to cover all skin tones; 01 - a pale, pink hue to improve complexion and emphasize clarity; or 02 - a multi-beige shade that matches and enhances any skin tone - formulated with nourishing ingredients to prevent dryness while simultaneously keeping shine and dullness at bay - for a smooth, lightweight and long-lasting finish. Housed in retro-inspired summer packaging and comes with an adorable matching patterned drawstring pouch and a softer than ever puff. Wow, how cute are these eyeshadow palettes!